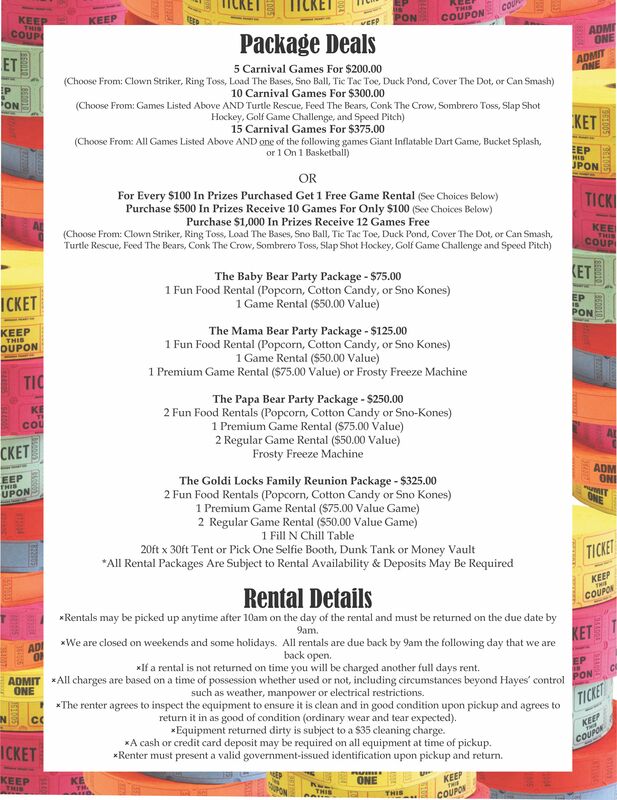 Main Category: Rentals LOCAL PICKUP ONLY | Sub Category: Games | Hayes Specialties Corp.
Can you get three in a row? Kids love the easy concept of this game. 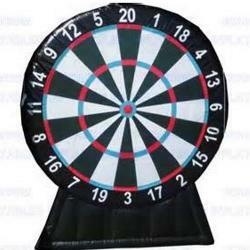 Set the level of difficulty by where you place the line to throw the ball. Easy assembly. Must be returned within 24 hrs from time of pickup. Late charges and cleanup charges will be assessed when returned. 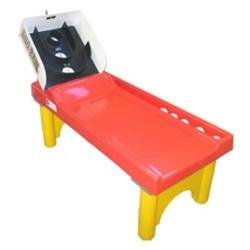 Includes 3 balls, Tic Tac Toe board, red base, 2 yellow legs. 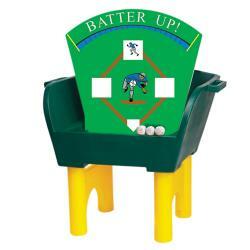 Load the bases is a fun game for children. 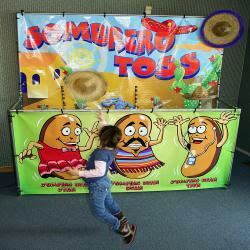 By using the included bean bag balls, th eplayer is given three chances to knock down the baseball characters. Quick set up and lots of fun Must be returned within 24 hrs from time of pickup. Late charges and cleanup charges will be assessed when returned. 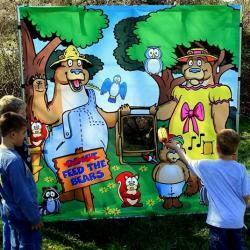 For the little ones here is an adorable and fun 7' x 7' Feed the Bears game. 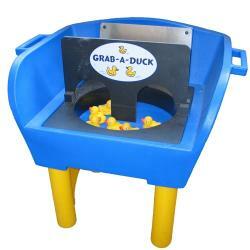 The kiddos just love tossing the plastic food into the bears' picnic basket Feed the Bears can be used indoors or out. This frame game breaks down to fit into it's own wheeled carrying case for easy transportation. Must be returned within 24 hrs from time of pickup. Late charges and cleanup charges will be assessed when returned. Game includes 1 - vinyl canvas, 4 - ground stakes, 1 - carry case, 1 - picnic basket w/ 15 food items, asst. pipes and hinges. 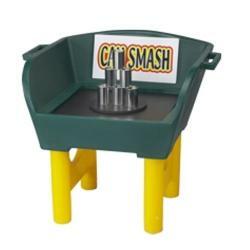 With the ring toss players receive 3 to 5 rings and players must land one ring onto one of the pins to win. Suitable for all age groups. Difficult Player must land 3 rings to win. Easier Player must land at least one ring to win. Must be returned within 24 hrs from time of pickup. Late charges and cleanup charges will be assessed when returned. 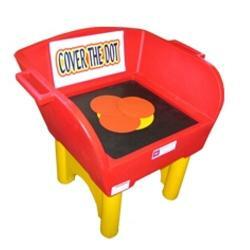 Includes 3 balls, Tic Tac Toe board, red base, and 2 yellow legs. 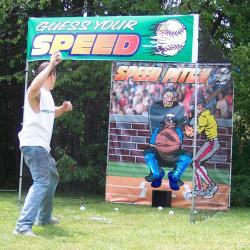 Can you take the Speed Pitch challenge? In this game you throw a baseball while a radar records your throwing speed. Can you throw like the all stars? Turn it into a game like the "clown striker" by making players compete to throw a pitch at a speed you select. 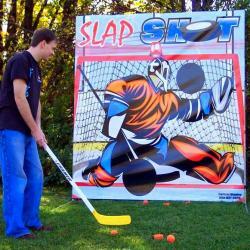 Speed Pitch is complete with a surrounding net to stop balls from flying everywhere and to keep passers-by safe. Must be returned within 24 hrs. from time of pickup. Late charges and cleanup charges will be assessed when returned. 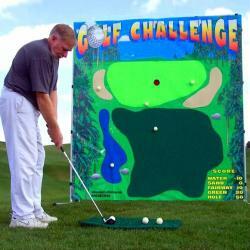 Golf Challenge is designed to look like a golf course, it is Velcro receptive, so the special Velcro practice golf balls stay right where you hit them. For pros or novices alike this game can quickly become addictive. Golf Challenge can be used indoors or out, this frame game breaks down to fit into it's own wheeled carrying case for easy transportation. Must be returned within 24 hrs. from time of pickup. Late charges and cleanup charges will be assessed when returned. 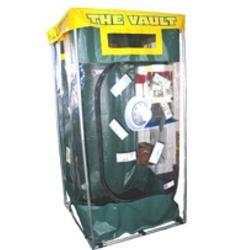 For a truly fun and unique incentive or prize, get someone to spend a minute in a money machine Fill with coupons or cash and watch the frenzy as your guests try to pick as much as they can. This rental machine is for local pickup only. Sorry, no deliveries Assembly required Includes frame, walls and blower. (Cash not included--ha ha) Standard 110V power required. 1 on 1 Hoops is made to be played by two people which makes for a fast paced, exciting challenge for kids and adults alike. An electronic score board keeps track of the scores so you can easily determine a winner. Folds in half for traveling. Must be returned within 24 hrs. from time of pickup. Late charges and cleanup charges will be assesed when returned. Children of all ages love to show up dad with this miniature version of the easy striker. 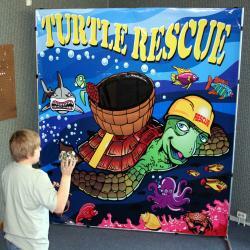 7' tall &amp 80lbs makes it easy for one person to transport and set up. Must be returned within 24 hrs. from time of pickup. Late charges and cleanup charges will be assessed when returned. 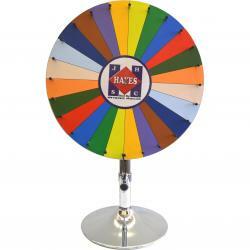 This Prize Wheel is great for a giveaway event, raffle, office party, or school carnival. 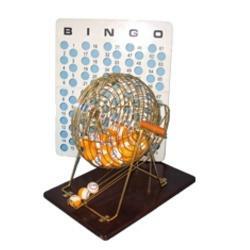 The prize wheel is 23.5" in diameter and can be set on a table. Must be returned within 24 hrs. from time of pickup. Late charges will be assessed when returned.